For many years in accordance with the needs and specifications of municipal sector representatives, P.S.B. 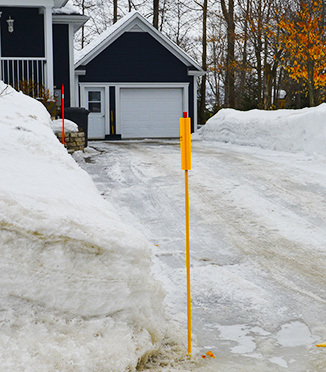 Gesma Inc worked into developing snow marker products used for protection of urban infrastructures against potential damages caused by machinery and heavy equipment during snow plowing periods. Today, we are proud to tell our initiative allowed us to sell our products in Canada, United States and also in the European Alps. 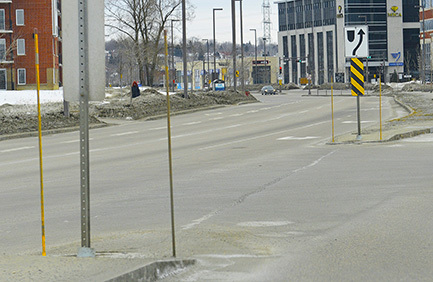 The R-6 Snow marker is characterized by a permanent anchoring concept making it a unique product. The stem or marker can be removed and installed on a seasonal basis at the exact same place year after year. The R-6 marker manufacturing properties offer a more secure environment than inadequate steel substitutes. 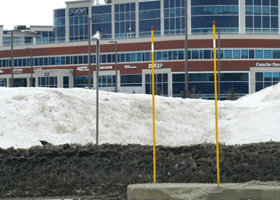 Our products have been put to the test for more than 15 years in Quebec's harsh winter conditions. Every year, more cities, governmental institutions and commercial clients joins the rank of our clients and include our markers to a broader range of projects. All of them agree, our markers represent a way of protecting their infrastructures which also translate into savings. In addition, the R-6 markers satisfy their security and aesthetic norms.